InterCasino have added the 5th addition to the DC Comics slots category, provided using award winning Cryptologic software. This adds to the already existing Green Lantern, Batman, Spiderman, Superman and Wonder Woman series. 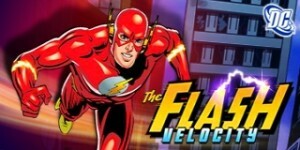 Play Flash Velocity and enjoy the 5-reel 50-line video slot featuring a bonus round giving players 3 different free game choices including expanding wilds, quad replay free games, and roaming wilds. The head of casino at InterCasino, Regis Pissot, said The online gaming scene was missing one of the most notorious and appealing superheroes of all. It’s a pleasure and a privilege to see him burst first into InterCasino. Our current and future players will be blown away by this blistering character and the fast paced action packed game brought to us by Cryptologic. The DC Comics slots are amongst our most popular games and after the successful launch of Green Lantern in 2010, this flash of red will consolidate our position as a premium destination for online casino branded games.